Five years ago, Good Morning America co-host Robin Roberts was treated for breast cancer. More recently, Roberts has been diagnosed with myelodysplastic syndrome (MDS). Roberts will undergo chemotherapy, followed by a bone marrow transplant in the fall. The bone marrow donor will be her older sister, Sally Ann Roberts, who is said to be an excellent match. 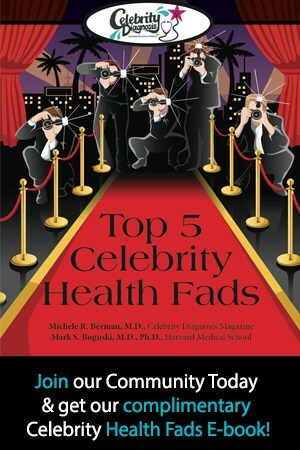 One of the underlying premises of Celebrity Diagnosis is that celebrity health conditions can increase public awareness of those conditions and may ultimately affect health outcomes. Robin Roberts might be seen as a “poster child” for this premise. On Tuesday morning, Good Morning America promoted bone marrow donation by sponsoring a bone marrow registry drive at ABC headquarters in New York. GMA’s George Stephanopoulos and Lara Spencer as well as ABC News President Ben Sherwood showed up at the drive and had their cheeks swabbed to register. But perhaps the best news is that, according to Jeffrey Chell, CEO of Be The Match, over 15,000 people had registered with the National Marrow Donor Program (NMDR) since Roberts announced her diagnosis. This is 11,200 more than the registry would normally receive in that period! It is estimated that 60 to 70 of these new donors will be a good match and have their marrow used in a transplant. However Robin Robert’s bone marrow transplant also highlights a more pressing problem- the shortage of minority donors. Because of this inequality, the chance of finding a match on the national registry is as low as 66% for African-Americans and other minorities, compared with 93% for Caucasians. Of the over 9 million potential donors in the Be The Match Registry, Caucasians constitute nearly three-quarters of the donors. 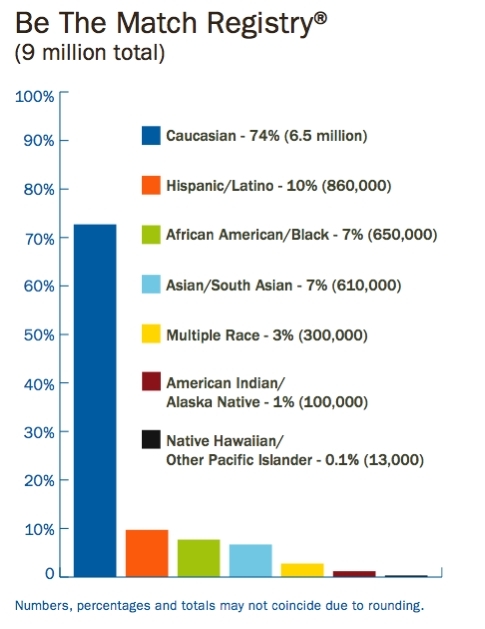 Hispanics are at 10%, and Asians and African-American/Blacks are at 7% each. As HLA typing tends to be closest within racial groups, this can make finding a suitable donor a difficult proposition. In multiracial populations, the problem is even more acute. And according to the 2010 census, the multiracial population among American children has increased almost 50 percent since 2000. This makes it the fastest growing youth group in the country. A number of myths and misconceptions about bone marrow donation may contribute to the reason minorities (as well as other donors) stay away. 1. All bone marrow donations involve surgery. Most bone marrow requests involve only peripheral blood stem cell (PBSC) donation. On occasion, marrow is retrieved surgically. These donors usually go home on the same day they donate. 2. Donating is painful and involves a long recovery. Many donors may have to take a drug called filgrastim for five days leading up to donation. Filgrastim improves the bone marrow donation by increasing the number of infection-fighting white blood cells. Patients taking filgrastim may experience headaches, joint or muscle aches, or fatigue while they are taking the medications, however they are typically back to their normal routine in one to two days. 3. Donating is dangerous and weakens the donor. Only five percent or less of a donor’s marrow is needed for a typical donation. This should not affect the donor’s ability to fight infection and is replaced by the body within 4-6 weeks. 4. In bone marrow donation, pieces of bone are removed from the donor. No pieces of bone are taken during a bone marrow donation, only liquid marrow is used. 5. Donors have to pay to donate. Donors never pay to donate. Be The Donor reimburses travel costs and may reimburse other costs on a case-by-case basis. Programs have been established to increase awareness in communities with a special emphasis on African Americans, American Indian/Alaskan Natives, Asian/Pacific Islanders and Hispanics. One of these is the National MOTTEP® (National Minority Organ and Tissue Transplant Education Program whose mission is to educate ethnic minority Americans about the need for organ, tissue and blood donations. MOTTEP simultaneously educates communities about the diseases and behaviors that lead to the need for transplantation.